Founded on the munificent ideals and ethics inscribed in the very soul of its founding father, Shri O P Jindal, OP Jindal Modern School, Hisar is a Senior Secondary, Co-educational, English Medium Day School with a whopping strength of about 5000 students. Affiliated to the Central Board of Secondary Education, Delhi vide Affiliation No. 530256 (School No. 04291) the school is run by O.P. 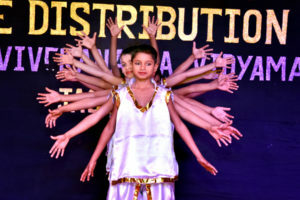 Jindal Charitable Trust. Ensconced amidst verdant surroundings, the school is situated away from the din and pollution of city life. Reflecting pure institutional excellence, the school building incorporates latest design and layout accommodating every soul with a feeling of space and secure environs. 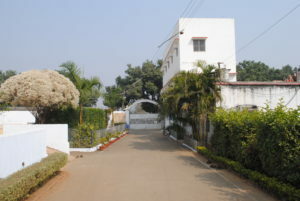 Its sprawling campus spreads over an area of 20 acres of land. The school offers Medical, Non-Medical, Commerce and Humanities Streams for students of classes XI and XII so as to enable them to identify their passion for disparate fields of education and acquire expertise, excellence and exposure in their desired streams under the mentorship and guidance of experienced, qualified and expert faculty to resolve their subject-related problems and offer them a wholesome learning experience. The earnest endeavors of Management, School Administrative Staff and teachers are directed to raise the bar of academic excellence in tune with the ethics and values deeply rooted in our culture and conventions. 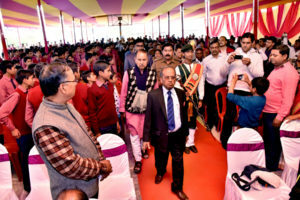 A spiritual under-current remains enshrined in all educational systems and processes to cater to the academic and creative needs of the students hailing from diverse socio-cultural, religious and economic backgrounds. A harmonious synthesis of well-defined vision, mission and well-enunciated set of values inflame the spirits of management, administration and teaching faculty to acquire high level of competence, quality and expertise through experimenting with and introducing new innovative teaching and learning methodologies for imparting the holistic and comprehensive education to students in alignment with global perspective of education. 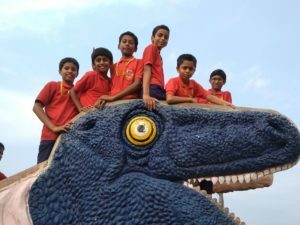 The school has been on a fast growth trajectory since its inception in 1997 and has grown from strength to strength within the span of 19 years. The school has recently turned a new leaf in its growth plan with the addition of two edifices of learning. Block A comprises students of Pre-primary to class I, Block B – Classes II to V, Block C – Classes VI to VIII and Block D – classes IX to XII. 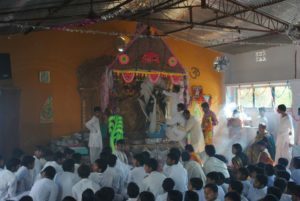 The four edifices of learning minister individually to the specific learning requirements of the students of myriad age-groups with an aim to maintain enviable student teacher ratio for imparting activity based quality education, better insight formation of the concepts taught and honing soft and life skill sets of students. The school espouses wholeheartedly the concept of decentralization of power and authority for smooth functioning of systems and processes. To put into the practice, each block is given under the charge of highly qualified, experienced and competent block-heads. Each block head has been given complete sovereignty to take decisions and exercise authority in best interest of stakeholders. To weave theoretical concepts with the practical applications like English Digital Lab, Maths Lab, Biology Lab, Physics, Chemistry Labs, Teacher Resource Centre, AV Rooms equipped with the latest high-tech, Smart Boards and educational software are in place. OPJMS is fortified with the muscled and state-of-the-art Infrastructure that lays the foundation for the fruitful learning experience of students. Spacious and well-ventilated rooms, Cricket-pitch, Basketball courts, Skating rink, Swimming pool, Athletic ground, Football ground, Badminton courts, Hockey ground, Multi-purpose Auditorium, Mini-Auditorium and well stocked Libraries with vast variety of books related to the subjects of study as well as reading well in tune with intellectual development, contemporary culture and artistic expression – all these collectively and immensely contribute to the generation of unique learning milieu for students. OPJMS at its ideological core believes that humanistic approach eventually leads an individual to gain insights in life and learn fruitfully and fearlessly. 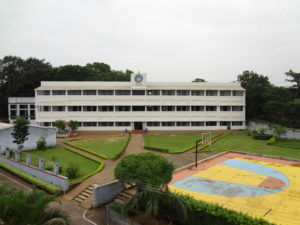 In the backdrop of such belief, the school ensures that a set of 25 to 27 students of each section of a class are given under the tender care and mentorship of each faculty member under the ‘Pastoral Care’ for personalized care and human touch to resolve their personal, social, academic-related issues and problems. With quality and excellence, being its priority since its inception, OPJMS has been able to pave its way to its own golden history with its unprecedented feat of being the first and the foremost educational institutional ever in Hisar to be conferred with a ‘Certificate of Commendation’ by IMC Ramkrishna Bajaj institution for its flawless educational processes, systems and academics offered to students.